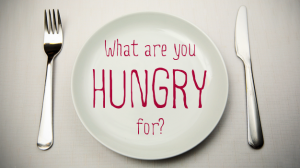 When was the last time you were hungry? Perhaps last year about this time, you started a new diet. About a week into the diet, you felt hungry. Hopefully you satisfied that hunger and still reached the diet goal. How about famished? Have you ever been famished? That is an interesting word – it means extreme hunger. Try skipping a meal. You may feel ‘hungry’ but I doubt ‘famished’ describes your physical state. After Jesus met up with John the Baptist on the Jordan River (Mat 3:13-17), He was led by the Holy Spirit into the wilderness to be alone with God. There, away from the crowds, Jesus spent 40 days fasting – listening and talking to God. At the end of the 40 days Satan challenged Jesus by suggesting He turn stones into bread so Jesus could satisfy His famished body. Jesus responded, no thank you, man does not live by bread alone, He lives by feasting on the Word of God. (Mat 4:1-11). Later, Jesus declared, “I am the bread of life. Whoever comes to me will never go hungry, and whoever believes in me will never be thirsty. (John 6:35, NIV). Before we can develop an appetite for righteousness, we must know what righteousness means. To me, it means right living. Striving to keep my focus on God daily so He may be glorified in all that I do, think and say. That is a pretty lofty goal. Here lately, I have found my self far from that ideal. I’ve been moody, angry, sometimes just not pleasant to be around. Oh, I would always put on the ‘good self’ when in public. But in private, there are few disguises. I’ve realized I am far from who I want to be and it is time to do something about it. How can that be? How did I lose the appetite for God’s Word? My spiritual diet changed. Rather than feast on the joy of God’s word, I began to feast on worldly things that have ravished my spiritual nature. Essentially, the Holy Spirit has convicted me that my life is not what it needs to be. I needed to make a change to my diet. For a diet to be successful, you have to want it to be successful. Are you ready for a spiritual diet in 2017? Open God’s word and ask Him to Open my eyes that I may see wonderful things in your law (Psalm 119:8 (NIV)). With pen in hand, open notebook and record what God is telling you. I ask that you pray for me – that I will be successful in this journey of renewal that began when my daughter told me to write about what God is telling me. I will also be praying for you as you listen for God’s whisper. This entry was posted in Spirituality, West Virginia and tagged Bread of Life, Just Do It, Spiritual Hunger. Bookmark the permalink. Bless you for sharing this side of you. We all have that dark, grumpy side — who knows where it comes from, where it goes. But you are right. Right living. It’s the only thing that will keep us alive and aware and moving forward. One day at a time. Fill your heart with love for the simple things, and God will find a way back into you. Thank you for sharing.